It’s one of the hottest buzzwords in digital marketing today. The truth is, Facebook Messenger chatbots can do just about anything a website can do… but they do it in a way that’s more personal and interactive. The potential with a well-designed chatbot is enormous, and it’s only getting bigger as companies like Facebook and ManyChat continue to develop new features for this rapidly evolving platform. 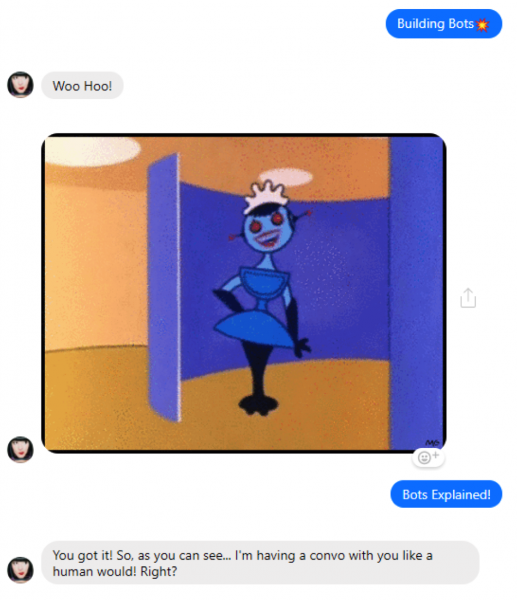 So instead of generalizing, we figured it’s better to simply show you what chatbots can do — starting with five of the best Facebook chatbots we could find. (Hint: all 5 of these chatbots were built using ManyChat). Thanks to Facebook Messenger, “conversational commerce” (the intersection of shopping and messaging apps) is finally becoming a reality. And for a great example, look no further than Kindred Bravely. Kindred Bravely is an ecommerce store for new moms. They offer nursing clothes, pajamas, and other clothing and accessories for any woman with an infant. 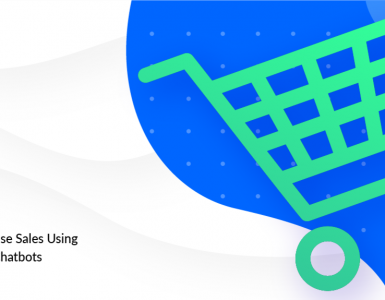 When you first interact with the chatbot, it’s clear from their very first menu that the focus of this bot is on helping you to shop for their products. Chatbots like Kindred Bravely aim to replace the clunky shopping experience on a website—requiring the use of multiple menus and filters—with a more intuitive, conversational experience. To get started, click the “Shop now” button to bring up a few of Kindred Bravely’s most popular product categories. And when you choose to “Browse” any of those categories, you’ll see a variety of products that fit within that category. 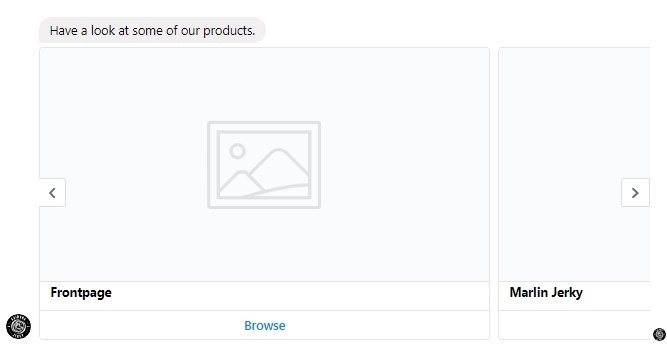 “Choose options” allows you to customize the product right there inside of Messenger. For this maternity nightgown, the bot first asks what color you prefer. (Notice how they smartly use the gallery format to show you what each of the colors looks like). Then you can choose from the different sizes available. Notice how this chatbot follows the same process you’d go through with a live salesperson in a store. 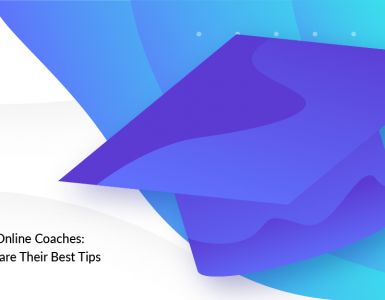 First they start by getting a general idea of what you’re looking for, then they begin to narrow down your preferences by asking more and more specific questions—showing you a range of options at each step along the way. 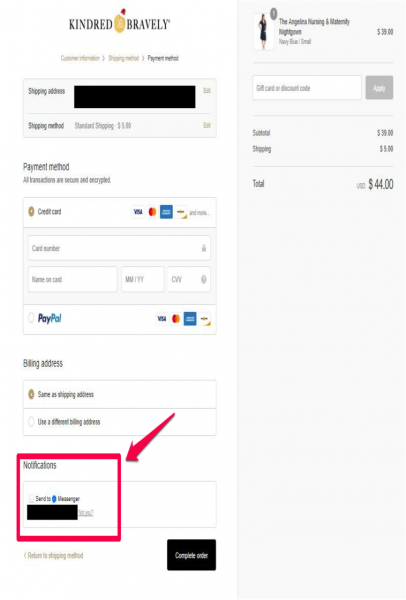 Clicking “Buy now” will open the shopping cart in a new tab with your order already entered and ready to go. 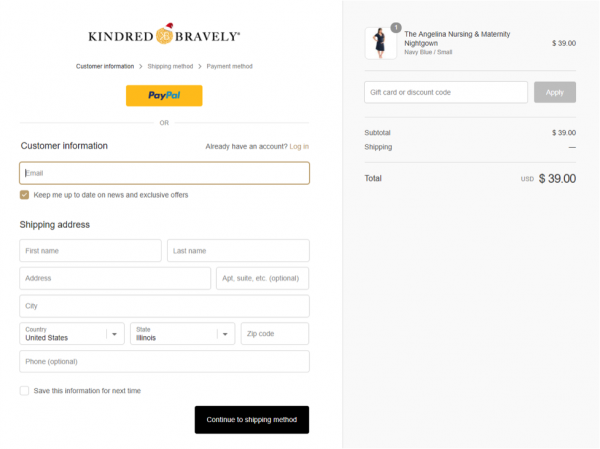 Near the end of your checkout, Kindred Bravely even gives you the option to receive order updates via Facebook Messenger—so you can receive your order confirmation and shipping updates inside of Messenger. But this chatbot does more than simply give you another way to make a purchase. For one thing, Kindred Bravely makes extensive use of keyword automations to make their bot as interactive as possible. Typing the keyword “get weekly nursing tips,” for example, will subscribe you to a sequence with weekly breastfeeding tips. 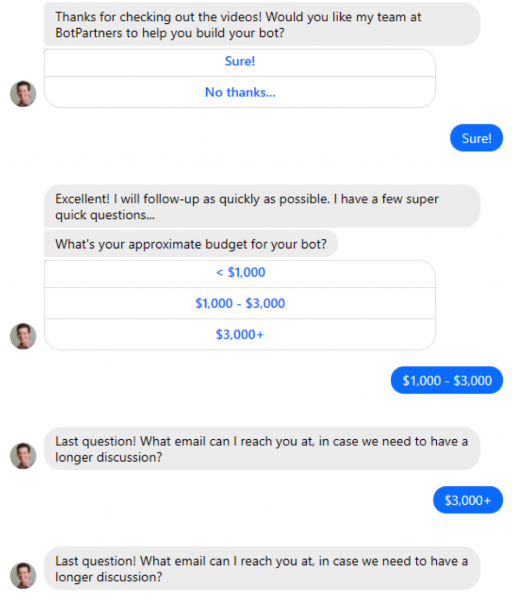 A quick look at the Sequences section of this chatbot reveals that they are taking full advantage of the ability to launch subscribers into focused sequences for events such as sales and product launches. 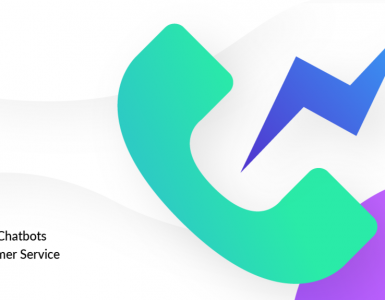 This makes it easy to reach out if you have questions or need help with your order—without having to search for a hidden “Contact” page, open a support ticket, or wait on hold for a phone representative. 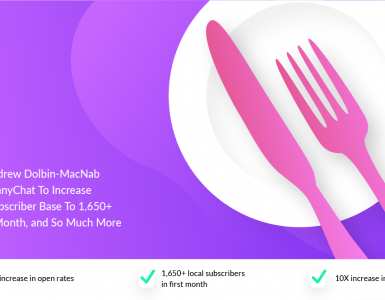 Molly recently posted a case study with details on how she used ManyChat combined with Facebook Live to reach 1 million organic users. So we thought it would be a good idea to take a deeper dive into how she uses ManyChat to engage her audience. When you first interact with the Mollybot, she wisely starts off by letting you know that this is, in fact, an automated chatbot. She also gives you some quick instructions on how to converse with it. Then Molly showcases some of her top content categories using the gallery format. Depending on which button you click, different things will happen. For example, clicking “Show Me!” under “Live Video Tips” brings up a menu with more options. What Molly is really doing here is showcasing her best content that’s relevant to the topic. 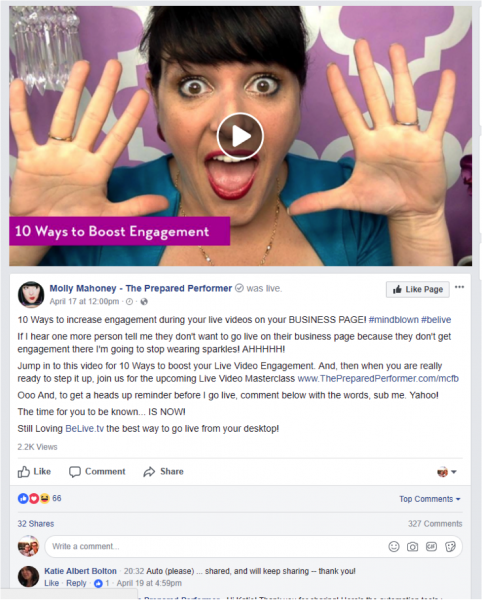 Some buttons, such as “Increase Engagement,” open a Facebook video in a new tab. Others begin an interactive teaching sequence. The “Building Bots” button, for example, tells you more about how she uses chatbots to engage her visitors. And just like Kindred Bravely, Molly also makes it easy to reach out to her with comments/questions and receive a personal response. 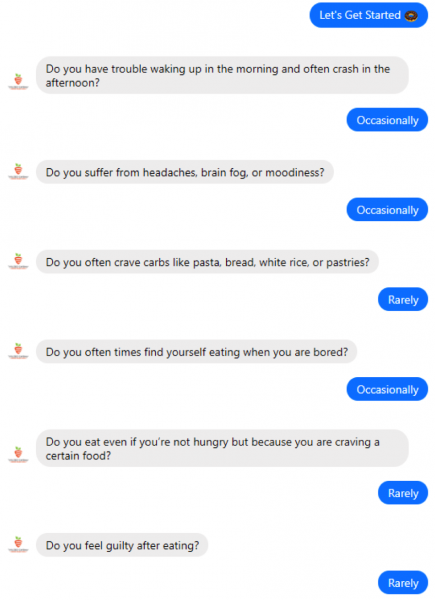 This is always a good idea, since no chatbot will ever be able to respond to every possible question people might have for you. 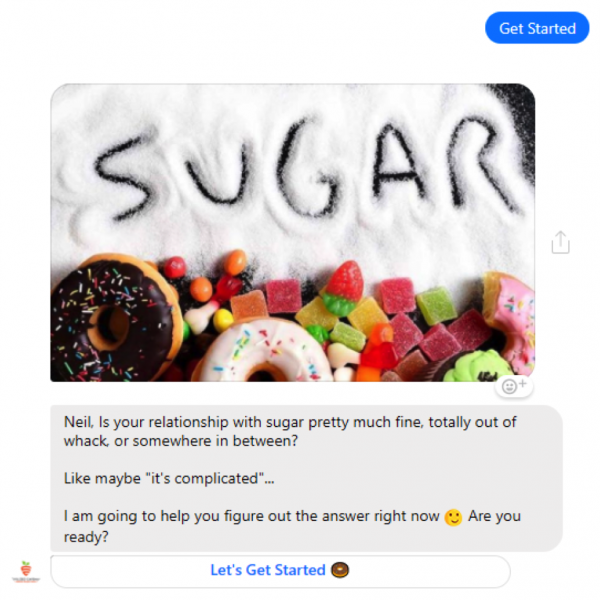 Civilized Caveman has been one of the first companies to take the standard lead-gen quiz and do it inside of Facebook Messenger. 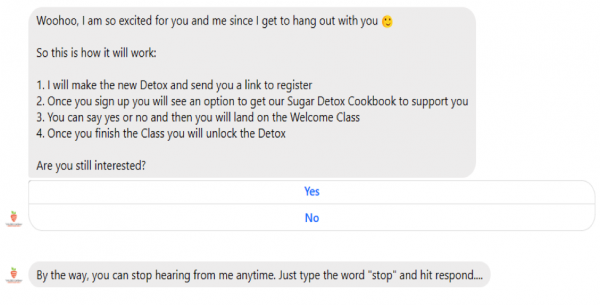 When you first interact, the chatbot steers you in one direction: taking their “sugar quiz”. From there, Civilized Caveman asks you a series of simple questions. Each question has 3 possible answers: “Rarely”, “Occasionally”, and “Daily”. Completing the quiz takes only a minute. When you’re finished, the chatbot calculates your results based on your answers. 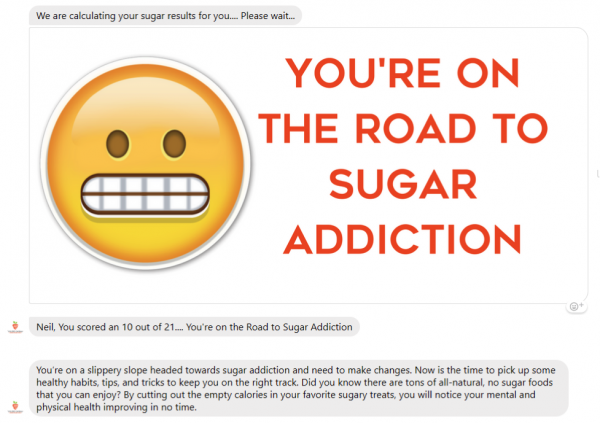 Once you get your results, you have the option to take part in their “7-Day Sugar Detox”. 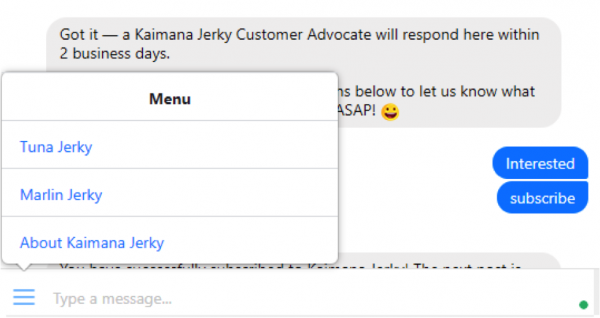 Kaimana Jerky is a great example of how even small new companies can use Facebook Messenger and ManyChat to reach new customers and grow their business. It’s a fairly simple bot. Probably the biggest function it serves is giving customers an easy way to contact the business with questions or comments—just click “Message our team”. A quick look under the hood reveals that Kaimana’s customers are happy to engage with the company on Facebook Messenger. You’ll also notice that the menu contains links to 2 of Kaimana’s product category pages and an “About Us” page. Lastly, I’d also like to point out that, like so many of the other chatbots in this post, Kaimana makes it easy to subscribe and unsubscribe for updates and new message notifications. This is important because you certainly don’t want to annoy people who don’t want to hear from you. 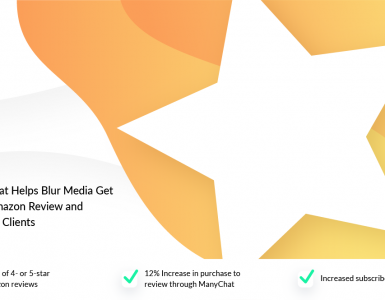 Giving people a clear opt-out keyword is a great way to help maintain your ManyChat list hygiene and ensure that you’re only sending messages to interested prospects & customers. 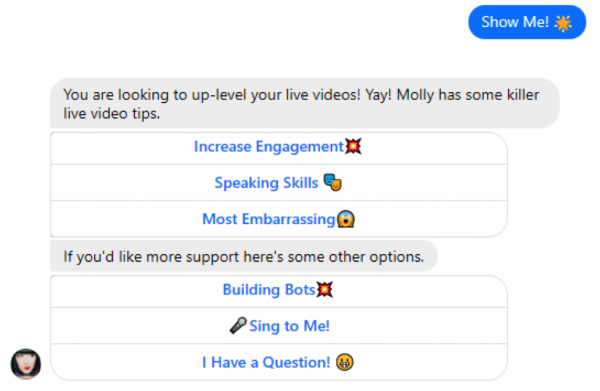 Lastly, I want to give a quick example of how you can use a chatbot to deliver content to your users in a way that’s simple, straightforward, and effective. 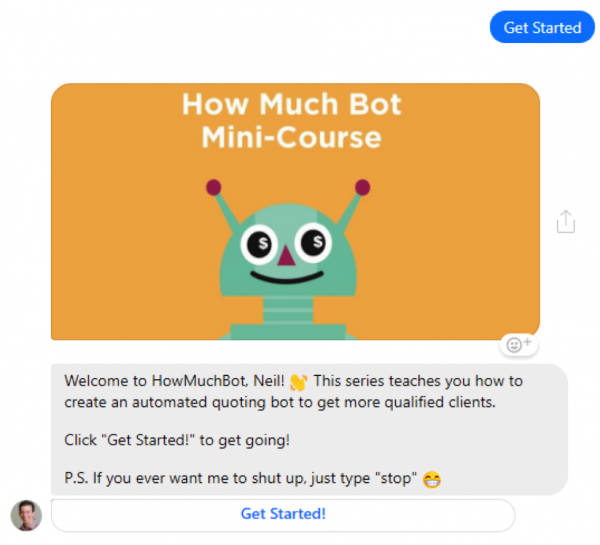 How Much Bot is a quick video course that teaches you how to create a automated quoting bot to get more clients. And when you click “Get Started!”, you’ll be shown a gallery with all 6 lessons in the course. When you click “Watch Video” beneath a lesson, the Facebook video opens in a new tab where you can watch and engage with the content. How Much Bot doesn’t stop there, though. 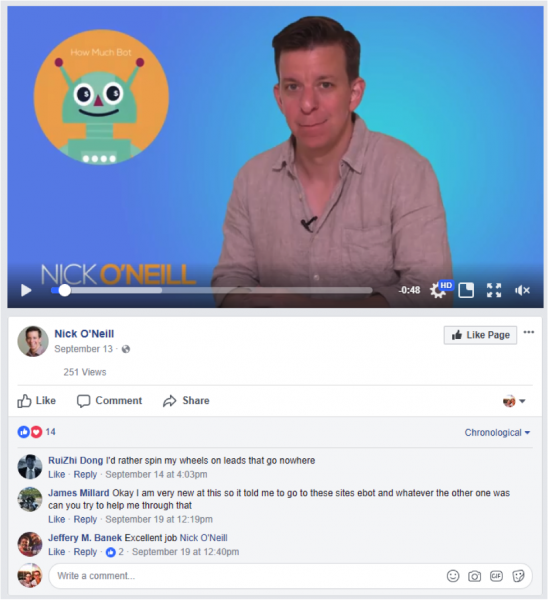 While he has your attention, creator Nick O’Neill takes a second to qualify you as a lead for his company BotPartners. If you indicate that you’d like help building a bot, you’ll be qualified as a lead after three easy questions. This chatbot is exciting for a couple reasons. First of all, this is one of the first hints we’re seeing of video courses and even potential membership “sites” that can be run entirely inside of Facebook Messenger. And second, it’s a great example of how to generate leads on autopilot for your business! Notice the formula O’Neill follows in this chatbot: first, deliver value while showcasing your expertise. Then capture your interested leads’ contact information for later follow-up by your sales team. What Do These Chatbots Have in Common? At first glance, it’s a tricky question. There may not seem to be any universal best practices. 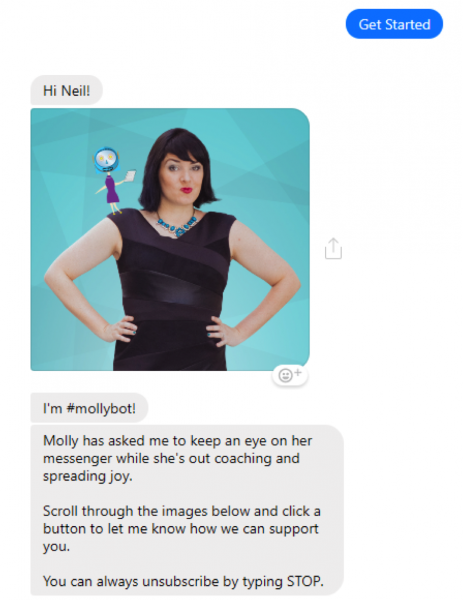 You’ll notice that almost every message in these chatbots is short and easy to read. There aren’t any long-winded paragraphs. Instead, almost everything is communicated in quick, one-sentence messages—just like most of our real-life conversations. And the best chatbots also manage to do so using a conversational tone that helps brand the company and makes the user smile at the same time. Just about every chatbot in this post takes advantage of the gallery format to add a visual component to things like product pictures and video previews. Anytime you need users to make a decision, giving them an image gallery will help make their choice faster and easier. It’s definitely a good idea to think about how you can make best use of the image gallery format. 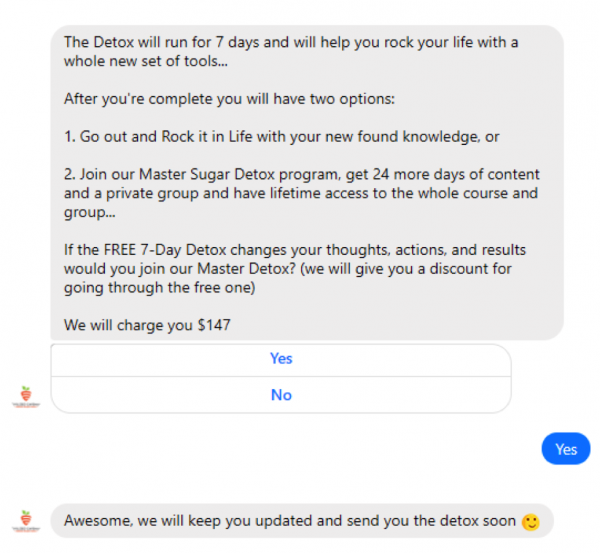 Most, if not all, of these chatbots explicitly ask the user if they would like to receive regular updates—whether it’s weekly tips, order updates, or new content. You never want to surprise users with unwanted messages. Make sure they actually want the updates your chatbot provides, and then, get their expressed permission to send them regular updates. Let them know what to expect from you—and provide an easy way to opt-out anytime they wish. Most importantly, these chatbots have all been created with the end user in mind, and designed to be as helpful and intuitive as possible for the human on the other end. You can tell the creators have spent a lot of time thinking about what their users are looking for and what they actually need at various times. 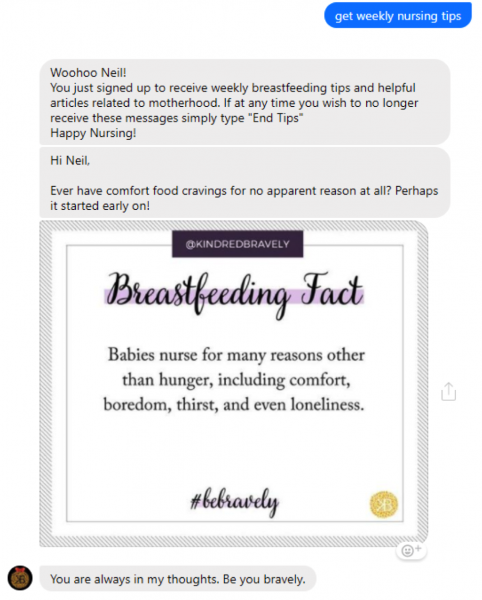 It’s no surprise that Kindred Bravely offers relevant content sequences, such as offering breastfeeding tips to new moms. It’s a perfect fit for their audience. Or that Kaimana Jerky makes it so easy for customers to reach a customer service representative. It’s what their visitors want. 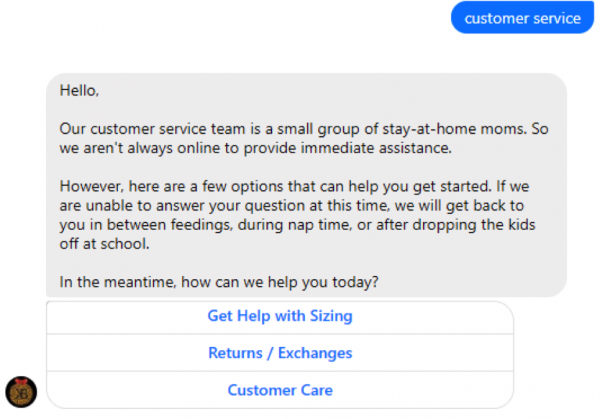 These chatbots have been designed to help real people with real problems. And if you want to create a chatbot that engages people and creates more business for your company, that’s what your have to do, too. Want to Build a Chatbot Like These? You can get started creating your own Facebook chatbot in minutes…and it’s 100% free! Just click here to sign up now for your free ManyChat account. And before you know it, you could be creating the world’s next great Facebook chatbot. Most of this chat box is not working. Manychat should update things.